Today in Pennsylvania the air is cool and smoky. I always return to thoughts of mystery in October; the mystery of life and what happens after life. Some believe the veil between the worlds of the living and the dead becomes thinner at this time of year. 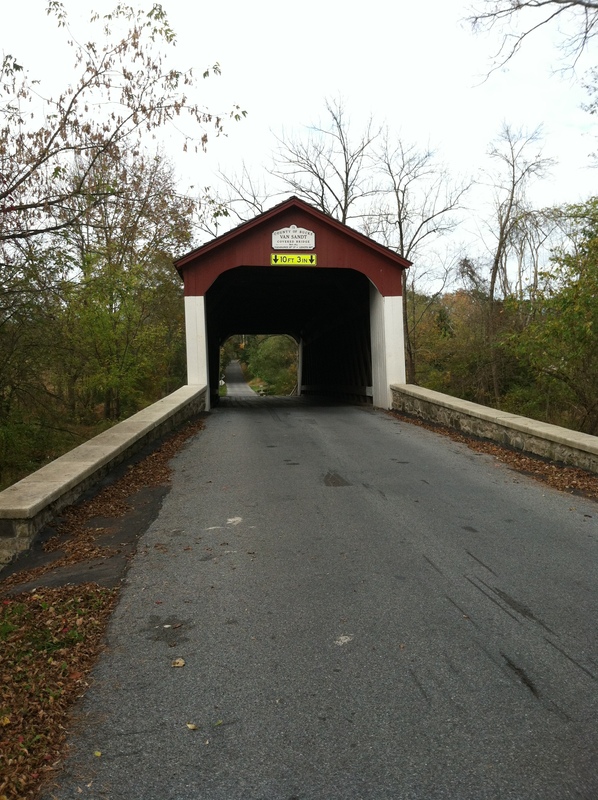 Last weekend Lee and I visited one of Bucks County’s historic places, the Van Sandt covered bridge. It was built in 1875 and is said to be haunted by the ghosts of horse thieves who were hung there. We wandered around, walked through the bridge and back. It was just a quiet old wooden structure. We sat on a low wall outside the bridge, enjoying the fresh air and the burble of the water in the creek below. Then a couple drove up and parked on the side of the road. They got out of their jeep and I saw that the man was carrying one of those devices that lights up when it detects an electromagnetic field (I know this from seeing one of those ghost-hunting shows on cable TV). The woman had an adorable little bulldog, with a pink bandanna around her neck, on a leash. They walked up the road to the covered bridge, but at the threshold of the bridge the dog stopped. She sat down and nervously peered inside. The woman tugged the leash and spoke coaxingly to her. The dog wagged her tail. She looked sweet and sheepish and awfully sorry to be so uncooperative, but she absolutely refused to go into the Van Sandt bridge. There are ghosts, by the way, in the novel I’m writing now. October also marks the one-year anniversary of the debut of Grace Grows. Thank you so much to everyone who has read the book and listened to the songs and reviewed it on Amazon or Good Reads or recommended it to friends. Thank you for communicating with me and Lee with such enthusiasm and kindness. You have made this one of the best years of our lives. In celebration, I’m giving away five copies of the book and the original soundtrack CD on Goodreads. They do say dogs are extra perceptive. I’d love to visit that bridge myself. There is something majestic and breath taking in the things made in times past. Congratulations on the one year anniversary of the publication of Grace Grows. That book was phenomenal and I’m really looking forward to reading your next book. I was wondering if/when it would forthcoming and it’s heartening to know it’s on its way. Enjoyed your post and love the picture of the bridge. I am looking forward to your next book. A new book!?! Hurray!!! I can’t wait to read it! It will be a while yet, but I’m working diligently, Laura! Your new book will be an automatic buy for me. Loved Grace Grows! October really has been beautiful so far here in PA. It’s so important to take the time and look at all the beauty around us. Red your book “Wie Tyler Wilkie mein Leben auf den Kopf stellt und was ich dagegen tun werde” (german titel) the second time and again I was pushed to many little things I know well from my own life…. Now I look forward to your next book. It’s November now, Leaves are falling in any colours and the days begin to get short. Time for a fine fire, candles a good book! Greatings from Germany to Pensylvania! The next book is coming, I promise!